Macedonia has become the latest country to face the tide of illegal immigrants and asylum seekers from Syria, Iraq, Afghanistan and Pakistan. 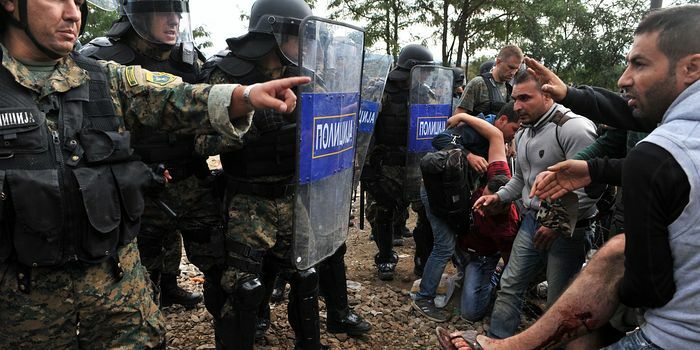 Macedonian riot police used truncheons, tear gas and razor wire to try and stop illegal immigrants travelling through Macedonia to get to Hungary where they can then travel without border checks to large swathes of the EU that stupidly signed up to the Schengen Treaty. Over 40,000 illegal immigrants and asylum seekers have been registered illegally entering Macedonia from Greece in the last two months. Most of them have gone on to Serbia and then into Hungary where the border is being fortified to prevent them getting any further. Almost 50,000 illegal immigrants and asylum seekers came from Turkey to Greece alone in July, bringing the total to 158,000 for the year. Another 90,000 have made it to Italy and the total estimate for the year so far is around 340,000. That's a city the size of Leicester making its way into Europe in just 7 months. If it continues at the same rate then by the end of the year that's a city the size of Nottingham and Leicester combined.